When Chen Dao's hand card number is greater than or equal to his current health level, he can use any hand card as an attack or escape. An Attack produced from "Elite Troops" has no elemental properties and has a suit that is identical to the one on the card used to produce it. "Elite Troops" is outstanding as a defensive ability when the condition is fulfilled. Almost every card that can be used to cause harm to another character can be prevented with the use of an Attack or an Escape. If he can restrain himself and keep his hand cards, he can last a long time with this ability and four units of health. 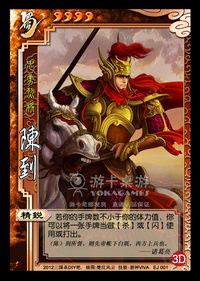 "Elite Troops" is useful as an offensive ability during Chen Dao's turn, as it allows him to convert less-useful cards like Lightning or Harvest into an Attack. It is also useful for getting around the Black Shield. "Elite Troops" is useful with the Crossbow and the Green Serpent Spear, as Chen Dao can use non-Attack cards as Attacks when his hand card number exceed his health limit before tapping into his supply of actual Attack cards after his hand card number falls below his health level. "Elite Troops" is useful in keeping Chen Dao alive, but it offers very little benefit for his team. This is significant, as teamwork is one of the most important elements in San Guo Sha. The requirement that Chen Dao must have more hand cards than units of health to activate "Elite Troops" requires him to restrain himself so he ends his turn with as many cards as he has units of health. As a result, he cannot always be as activate as the other characters in this game. Chen Dao is incredibly weak to card destruction techniques. If the condition of "Elite Troops" is not fulfilled, it is of no use to Chen Dao and he has nothing else to fall back on. Liu Bei (Especially with Liu Bei as king) - Liu Bei and Chen Dao can work well together. Liu Bei can give Chen Dao cards via "Kindness" to make it easier for him to use "Elite Troops." Even better, if Liu Bei is king, Chen Dao can use "Elite Troops" when Liu Bei uses his king ability "Fierce General" to supply him with Attacks. Xun Yu/Guo Jia/Lu Su/Chen Gong/Bu Lian Shi/Xu Shu/New Xu Shu - These characters have abilities that allow them to increase the cards in another character's hand. These characters can increase the number of cards in Chen Dao's hand and make it easier to use "Elite Troops." Zhang Liao/Zhang He/Lu Su/Gan Ning/Jiang Wei/Pang De - These characters specialize in card destruction. If they are Chen Dao's enemies, they can use their powers to reduce the number of cards in his hand and make it more difficult to use "Elite Troops." Ma Chao/Huang Zhong/3D Pan Feng/Lu Bu - These characters have abilities that can make their Attacks difficult or impossible to Escape and, as a result, make "Elite Troops" less useful. Zhen Ji/Lu Meng/Liu Shan - These characters have abilities that either allow them to store more Escapes or make it more difficult to Attack them. As a result, "Elite Troops" is not very useful as an offensive ability against them. King Chen Dao is a poor king choice. When he is the center of attention, he will lose hand cards (and also health) very quickly. Loyalist Chen Dao is a poor loyalist choice, unless the king is Liu Bei. "Elite Troops" is a self-serving ability that usually provides little-to-no benefit for the king. Rebel Chen Dao is probably best as a rebel, so long as there are other rebels on the team that can lead the charge. "Elite Troops" allows Chen Dao to stay strong throughout the course of the game and avoid being the 'weak link' while (slowly) contributing to the long-term goal of the rebels by consistently Attacking a loyalist or king. Spy Chen Dao is a serviceable, but not outstanding spy pick. He can usually survive the entire game, but he cannot change the game quickly if one side suddenly gains an advantage over the other. Chen Dao fits in well with 'Shu Brutes' like Zhang Fei, Guan Yu, and Zhao Yun. Unfortunately, this is not a compliment. On the bright side, he seems to perform a little better than these lugheads. When using him (hopefully only as a rebel or spy), restrain yourself and make sure you end your turn with as many cards as you have units of health. Use "Elite Troops" to convert non-useful cards like Harvest or Lightning into Attacks. Never use Attacks or Escapes if you can convert a less useful card to accomplish this via "Elite Troops."